What’s this, you say? 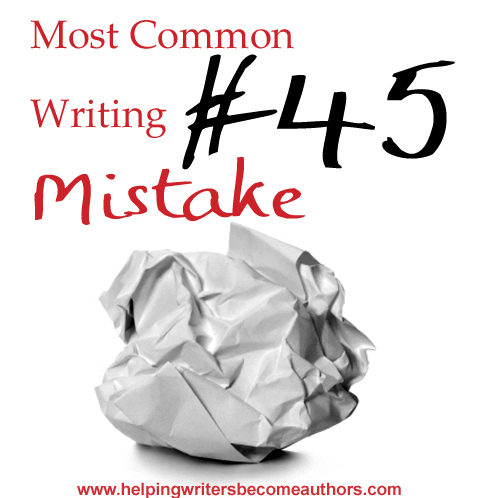 Avoiding “said” is one of the most common writing mistakes? How can that be? Surely writers overuse this ubiquitous little word more often than not, don’t they? As a matter of fact: nope. Indeed, trying to avoid this hard-working little speaker-attribution tag can, in most instances, lead you into some major prose problems. If you run a word-frequency search through your manuscript, “said” is probably the verb that shows up the most. For some writers, that sets off alarm bells in their heads. If a word shows up that frequently, then surely you must be overusing it. Readers will notice its repetition and stumble over it as it clutters your prose. As a result, you might be tempted to start replacing “said” with more colorful alternatives. After all, writers are always being told to look beyond pedestrian verbs like “walked” for more specific and “showing” choices, such as “sauntered,” “limped,” and “marched.” The same must be true of “said,” right? It’s a legit question–so let us take a look. The problem with replacing our little workaday friend “said” with more flamboyant and specific alternatives is two-fold. Problem #1: “Said” alternatives are usually counter-productive in that they end up drawing way more attention to themselves than plain-Jane “said” ever would. Problem #2: Unlike most colorful verbs, which work to “show” readers the action, flashy dialogue tags actually have exactly the opposite effect. Dialogue is arguably the only true form of “showing” in written fiction, since the words should ideally be able to stand on their own without the author interjecting his own guidance or interpretation. But that’s exactly what non-“said” speaker tags do. They tell readers how to read the dialogue. In most (although definitely not all) instances, that’s going to drain a little of the vibrancy and immediacy right out of even the best dialogue. Sinead’s kids were screaming in the backseat as she drove home from the grocery store. “I want ice cream!” Michael shrieked. “You’re late!” her boss roared. As you can see, even a variety of speaker tags can get repetitious (and very silly) fast. Can You Overuse “Said” in Your Dialogue? Okay, so we don’t want to overuse non-“said” tags. Got it. But that brings us right back to our original conundrum: Can you overuse “said” itself in your dialogue? “I want ice cream!” Michael said. “You’re late!” her boss said. In all honesty, this is still probably better choice than the previous example, despite the more obvious repetition. At least it’s not hitting readers over the head with the author’s thesaurus. But it’s also the perfect example of why authors get twitchy with “said.” Slather this many “saids” into your dialogue, and you’re totally right to fear that readers will get annoyed. Thing to Understand Numero Uno: When used with wise restraint, “said” is virtually invisible. So long as the rhythm of your prose cooperates, you caninclude “said” in practically every other line of dialogue–and readers won’t notice. “Said” is a background word–not unlike “the,” “he,” “she” or your character’s name. Use “prestidigitation” even as many as four times in a book, and readers may well take notice. But you can use “said” over and over again without it ever registering. Thing to Understand Numero Dos: Just because you can use “said” with comparative abandon doesn’t mean you should. I ran a search in my 143,000-word work-in-progress; “said” shows up 311 times–which, honestly, kind of shocked me. That’s not very often, really. And the reason it doesn’t show up more than that is because there are a host of other options at the author’s fingertips. 3. When the rhythm of the prose demands it. Even then, you’re always going to want to consider whether or not an action beat might not be the better choice. An action beat indicates an action performed by the speaker, in association with his dialogue. Because it references the speaker, it eliminates the need for an identifying speaker tag. And because it often provides context for the dialogue, it can often pull double duty by helping readers understand the tone in which the speaker is talking. Optimally, you’re going to want to incorporate a conscious mix of action beats and “saids,” along with the very occasional alternative speaker tag. “Me too!” Cassandra said from her car seat. Like any tool in your writing bag, “said” must be used with care. But don’t feel you have to avoid it. Common though it may be, “said” is one of the writer’s hardest workers. Indeed, its very commonness is what makes it so useful! Wordplayers, tell me your opinion! Run a search through your WIP. How many times have you used “said”? Too many or not enough? Tell me in the comments!